The big journalism news is that Ezra Klein and some friends are leaving the Washington Post for an all Internet media company, Vox. 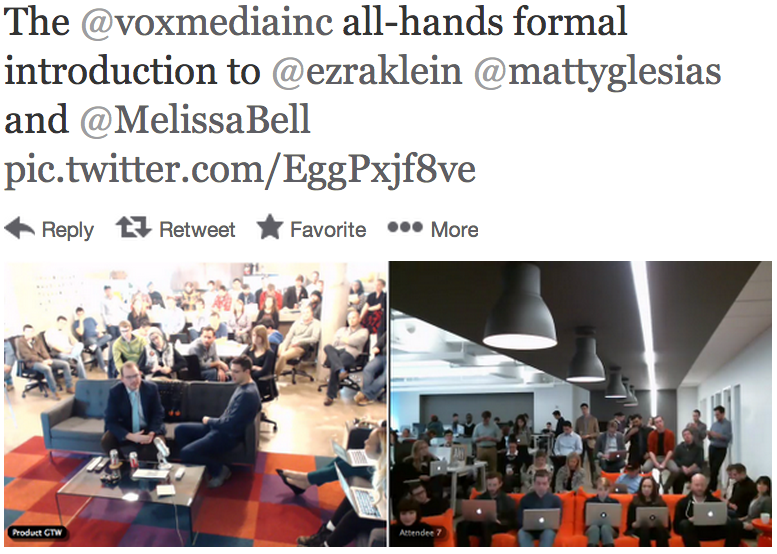 Here are pictures of Vox's staff, which looks remarkably like that picture of the 2012 Obama campaign staff, all the way down to having one black guy in the back row. Just as the Obama campaign was headquartered in Chicago, where no blacks live, Vox is based in Washington D.C., so there weren't any additional black workers available within a 100-mile commuting distance. By the way, nobody should ever suggest that Matthew Yglesias is a tad out of touch with the Common Man. After all, his grandfather was the film critic for the CPUSA's Daily Worker.